One of the most important issues in determining the merit of transcriptions is if the different instrument can bring the piece to life in a way that enhances what the music has to say. The double bass, with its rich profound tonal palette, can probe the depths of expression that a work like Kol Nidrei demands and shed new light on its meaning. 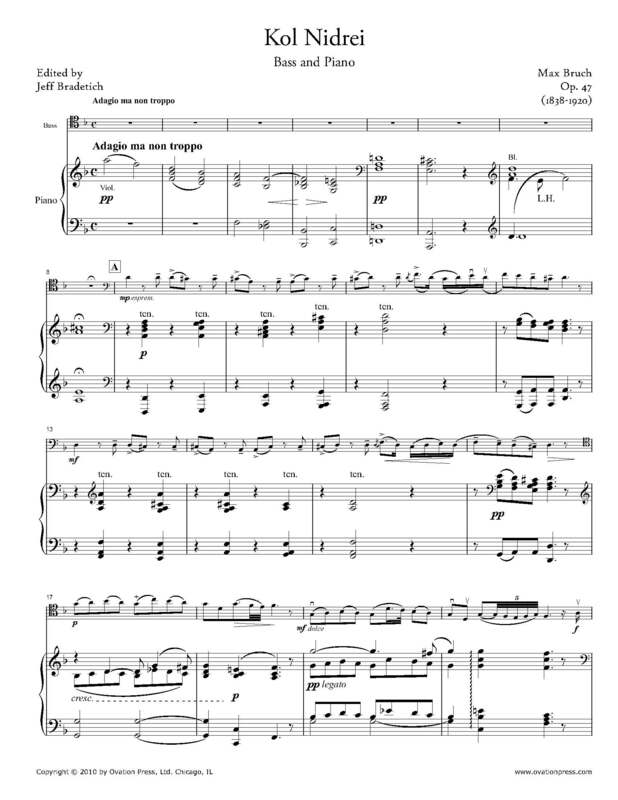 Bruch completed this composition in Liverpool before it was first published in Berlin in 1881. It is styled as an Adagio on 2 Hebrew Melodies for Cello and Orchestra with Harp and consists of a series of variations on two main themes of Jewish origin. The first theme, which also lends the piece its title, comes from the Kol Nidrei prayer recited during the evening service on Yom Kippur. In Bruch's setting of the melody, the cello imitates the rhapsodical voice of the hazzan who chants the liturgy in the synagogue. The second subject of the piece is quoted from the middle section of Isaac Nathan's arrangement of "O Weep for those that wept on Babel's stream," a lyric which was penned by Byron in a collection called Hebrew Melodies.